4 different heights available for your drum riser! Allowing you to put the drummer in the air for a cleaner, more professional look on stage! Easy to assemble drum riser gives your worship band a professional look! Complete 8' x 8' (64 sq. 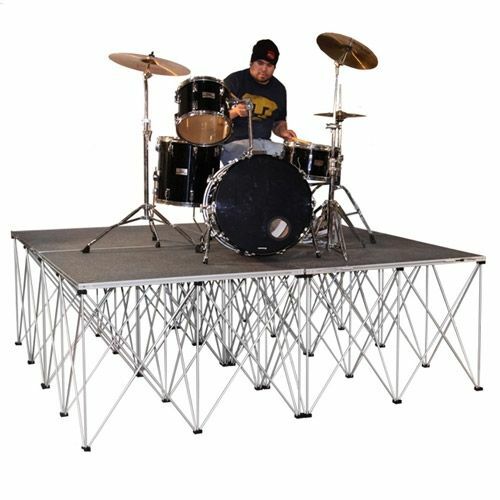 feet) drum riser package is sturdy, lightweight, and compact. 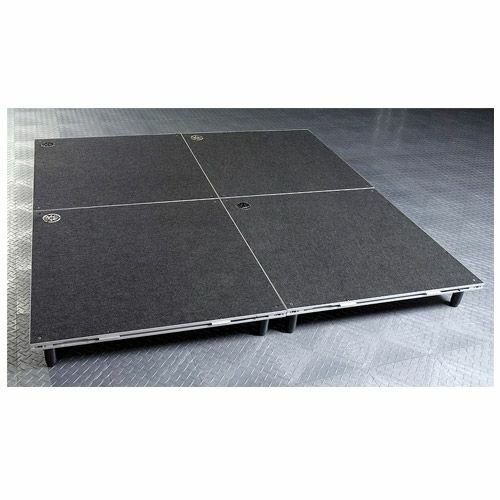 This kit consists of 4 pieces of 4' x 4' carpeted stage platforms and matching risers with hardware. Choose from 8", 16", 24", or 32" risers. Will hold a full 5 piece drum kit or larger. Make your worship band drummer fell like more of a part of the service by making him easier to see. If these options are to big for you and you are looking for a more portable solution for a drum riser, look no further. Intellistage also has a very affordable and portable option. A 36 sq. ft' drum riser with 6" legs. It consists of 4 pieces of 3' x 3' carpeted platforms that can easily fit inthe trunk of your car. So with all these options, finding a drum riser to fit your needs is very easy! Matching risers in 4 different heights: 8", 16", 24", 32"